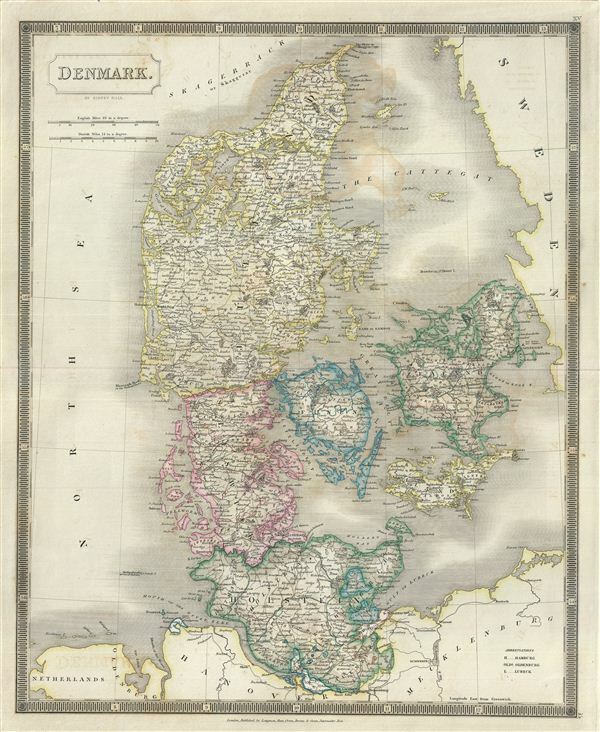 This is a beautiful map of Denmark from Sidney Hall's extremely scarce 1835 New General Atlas. It covers all of Denmark inclusive of the Duchy of Holstein and the islands of Zeeland, Funen and Laland. The Kattegat (Cattegat) is also identified. Hall notes the site for the 1801 Battle of Copenhagen under Vice Admiral Horatio Nelson and the 1807 Battle of Copenhagen under Admiral James Gambier. At this time in history, all of Scandinavia was in the midst of a prolonged period of peace and prosperity that led to a cultural and population boom. Towns, rivers, mountains, railroads, marshes and various other important topographical details are noted. Elevation throughout is rendered by hachure and political and territorial boundaries are outlined in color. Rumsey 4224.015 (1830 edition). Philips (Atlases) 758. Ristow, W., American Maps and Mapmakers: Commercial Cartography in the Nineteenth Century, p. 303-09.